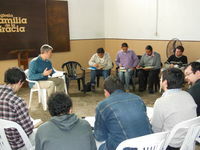 From April 17 to April 20, Paul Washer and I traveled to Rosario, Argentina to help conduct a Bible conference for Argentine pastors. 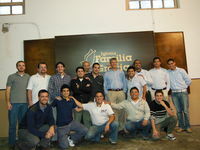 A small group of 15 pastors attended, coming from all different parts of the country. Several of the men came from Buenos Aires, some came from a small port-city about twelve hours south of Rosario, and some came all the way from the southernmost region of Argentina near the Patagonia. These teachings took place in the mornings, followed by several hours each day of questions and answers, conducted by Brother Paul. Many of the men are very isolated in their specific ministries, not having any churches or other ministers nearby with whom to have fellowship, and it was obvious that they were blessed by the opportunity to receive instruction in the Word with regard to the pastoral ministry. Each evening we spent many hours with Nicolas and Esteban, discussing the needs in Argentina and considering how the Lord might be leading us to participate in the advancement of His Gospel there. During those hours of conversation, we discussed ways to help Nicolas and Esteban further prepare and become equipped for training up pastors and teachers in Argentina in the future. We also discussed possible ways of further training and influencing the men who were present at the conference, and those who are desirous to grow in a knowledge of the Word in order to better shepherd their congregations. There was an obvious hunger among the men for further training and instruction and a sincere burden to grow in effectiveness as pastors and ministers of the Gospel. Please pray that the Lord would grant us wisdom in considering how to move forward and be used in the advancement of the Word in this country. Pray that the Lord would cause rapid progress to be made in the equipping of these men, and that their churches would be blessed and strengthened as a result. 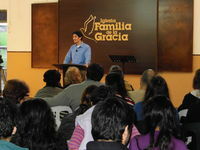 Nicolas taught from Ephesians 3 on God's Eternal Purpose in His Son. Walter gave a solemn warning to pastors from 1 Timothy. From Acts 20, Esteban used the apostle Paul as an example for ministry. Paul spent the afternoons answering questions and instructing from the Word. 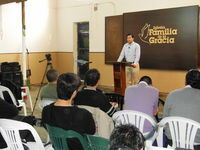 Pray that the teaching given at this conference would produce lasting fruit. The small setting allowed for personal interaction and instruction with the men. 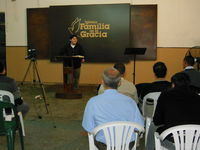 We were also able to attend a Sunday fellowship with the church in Rosario. 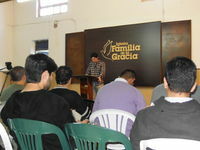 At the Sunday service, Nicolas taught on the humility of Christ.